The LA Unified school board today postponed until next month any consideration of how to fill the board seat left vacant by the death of Marguerite LaMotte, bowing to a wave of pleas from speakers asking the board to wait until after her funeral. A 3-3 vote on a motion to allow discussion to begin effectively killed the effort. A six-member board requires four votes for any measure to pass. President Richard Vladovic, Tamar Galatzan and Monica Garcia voted in favor of consideration; Steve Zimmer, Bennett Kayser and Monica Ratliff voted to wait. The board then voted unanimously to schedule a special meeting Jan. 7, when a debate will begin over whether to fill the seat through a special election or a board appointment. The funeral for LaMotte, who died Dec. 5, is scheduled for Saturday. The board’s first vote was preceded by a parade of speakers, a majority of whom urged the members to defer action out of respect for LaMotte’s family and legacy. Typical of the passion was that from Patricia Sanders, vice president of the New Frontier Democratic Club, who argued that it was “time to memorialize and funeralize” LaMotte, who, she said, “would be pissed off to the highest point of pissivisity,” were the board to act so quickly after the death of another member. The notion of deferring action was scarcely raised publicly until US Representative Maxine Waters, who had strongly campaigned to fill the seat by appointment, issued a press release hours before the meeting, calling for a delay. It was also around the same time that speculation arose that the board was lining up, 4-2, in favor of approving a special election, rather than an appointment. Ratliff, who grew emotional during an iPad discussion earlier, was wiping her eyes as Waters concluded. Altogether, about a dozen speakers echoed Waters’ sentiments, some of them signatories to a Waters-supported effort over the weekend to advanced George McKenna, a former LA Unified administrator, as an ideal candidate for appointment. A website promoting McKenna that included Waters’ and other community leaders as supporters made no argument to defer board action. McKenna attended the board meeting but left before the voting. Nearly as many speakers, including LA Supervisor Mark Ridley-Thomas, argued strongly for a special election, saying black Americans had struggled too long for voting rights, and they should not be denied them in this case. Oddly, the competing points of view were not necessarily mutually exclusive. Proponents of delaying succession did not argue one way or another for an election or appointment, and those favoring a special election expressed no opposition to waiting in their remarks to the board. 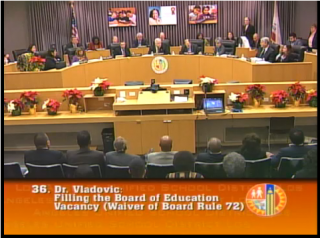 The practical effect of the board’s decision to wait is that the seat remains vacant at least another three weeks. Despite the holidays, it gives proponents added time to build support for their preferred method of replacement and lobby board members. Should the board vote to appoint someone, that could then occur at any time. But in the case of a special election, the city has told the school district that it needs at least 110 days to prepare for an election that does not fall on an election day not already scheduled. In either case, the successor would only serve out a term that ends in mid-2015. An agenda item that amended the plan was postponed to the board’s Jan. 14 meeting. But later, a resolution from Galatzan and Garcia to start the plan as passed last month was defeated in a 3-3 vote. Both Galatzan and Garcia argued fiercely that a further delay was unfair to district students in 38 schools waiting for iPads and those in seven high schools waiting for laptops, as well as students in all other district schools waiting for their digital devices in subsequent phases of distribution. Ratliff, who chairs the board’s technology committee, said she wanted to honor LaMotte before acting and also wanted the Bond Oversight Committee, which is meeting tomorrow, to weigh in on any changes. Previous Posts: LaMotte Funeral Scheduled for Dec. 21, Closed to Public; Black Leaders Speak Out on How to Fill LaMotte Seat; In Replacing LaMotte on LAUSD Board, Zimmer is Key.